Janet Norman Knox is one of those rare people who are comfortable in both the world of science and the world of art. An environmental geochemist by profession, she folds poetry into her life whenever she can. 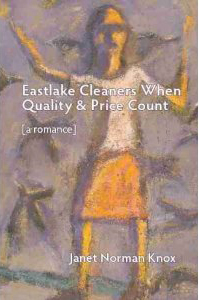 Knox is the author of the chapbook Eastlake Cleaners When Quality & Price Count [a romance] (2007). Fellow author Ilya Kaminsky describes the book as "... true poetry, exciting and imaginative in its scope, muscular and memorable in its verbal music. It is memorable because it is dares to go places we haven't heard of, and do so with grace that is wild, yes, but also heart-rending." Seven-time Pushcart nominee and 2007 finalist for the Discovery/The Nation Award, Janet Norman Knox’s poems have appeared in Los Angeles Review, Crab Creek Review, Rhino, Diner, Seattle Review, Adirondack Review, Poetry Southeast, Cranky Literary Journal, Red Mountain Review, and Diagram. When she was awarded the Ruskin Poetry Prize (Red Hen Press), she had the honor to read with Paul Muldoon and Molly Peacock. The Los Angeles Review nominated her for 2010 Best New Poets.